The monthly Swine Budget created by the Ministry of Agriculture, Food and Rural Affairs provides a guide and format to estimate the cost of production for a swine enterprise. See how you compare. The June Swine Budgets are now posted. What are your pigs playing with? A lot of producers stopped by the Ministry of Agriculture, Food and Rural Affairs booth at Pork Congress to share their ideas for enrichment toys. Some ideas included blocks of wood, rope, tough dog chews, straw, rubber balls and commercially manufactured toys. 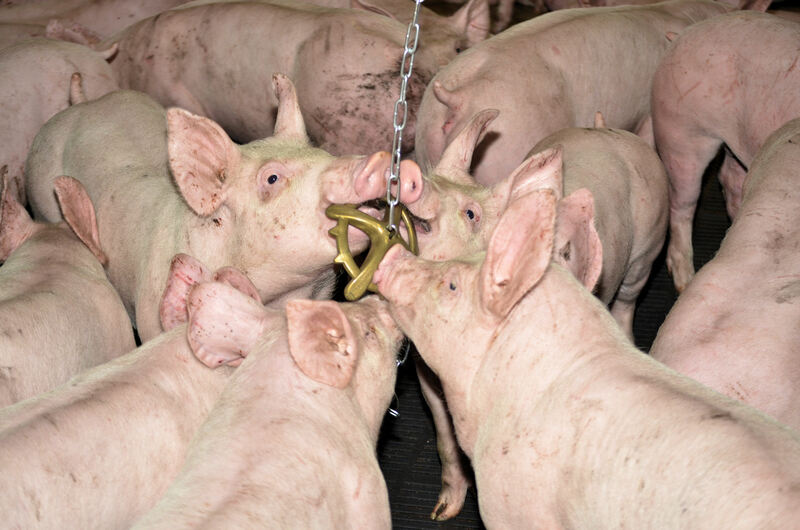 Some producers hung these on chains while others let the pigs root them around in the pen. All pigs have a need to chew and root. By providing enrichment toys this need is satisfied and tail and ear biting may be reduced. The need to provide some form of enrichment toys is included in the new Code of Practice for the Care and Handling of Pigs. What are your pigs playing with? The University of Guelph and the Ontario Ministry of Agriculture, Food and Rural Affairs, have jointly developed a free app available from Google Play or Blackberry Marketplace that lets you calculate the level of heat stress experienced by livestock. The governments of Canada and Ontario are investing up to $2 million under Growing Forward 2 so that farmers and others who work with farm animals can receive training in animal care. Farm and Food Care will develop training materials, deliver courses and help farmers implement new practices into their operations under the two-year program, which will be offered beginning this September. It will help those who work with farm animals keep up to date with the latest research, standards and practices related to farm animal care.